Photos by "Jon S on Flickr":http://www.flickr.com/photos/[email protected]/ and used here with Creative Commons license. When I saw that the media industry’s annual report card had been released late Sunday night, I clicked and scanned through the key findings for newspapers — the industry that has been my daily passion since I fell in love with journalism at my high school paper. I hoped to learn that the wise folks at the Project for Excellence in Journalism had crafted a magical algorithm. I was searching for a solution that would spit out piles of cash so newspapers could once again invest in the type of public-interest journalism that serves the greater good by exposing corruption in Bell, Calif., mistreatment at Walter Reed Hospital, and a break-in at the Watergate. Newspapers continue to produce the news that matters most. Yet, it's newspapers that are missing the opportunity to cash in on this growing demand." Instead, here’s what I learned from the State of the News Media report: News and information are increasingly more important to people’s lives, and newspapers remain the primary source for civic affairs reporting. Also, news consumption is a big part of mobile phone and tablet use. But, the businesses profiting from these trends are technology companies, not newspapers. That is all to point out: People want news. Newspapers continue to produce the news that matters most. Yet, it’s newspapers that are missing the opportunity to cash in on this growing demand. 1. Declines in print newspaper advertising revenue are outpacing the growth of digital revenue by 10 to 1. The “print dollars vs. digital dimes” challenge continues. 2. Online media showed the strongest growth in audience (up 17 percent) and revenue (23 percent) of any media industry. 3. Google collects 40 cents of every $1 spent in online advertising. Google, Yahoo, Facebook, Microsoft and AOL combine to account for 68 percent of all online advertising. 4. 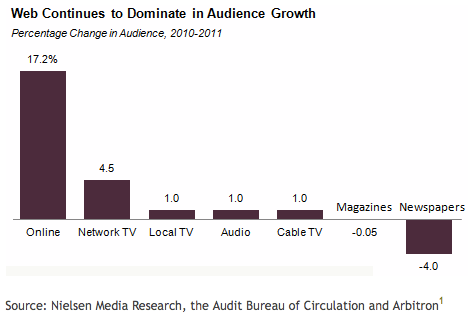 Newspapers are the only one of seven media sectors to report a significant drop in audience between 2010 and 2011. Newspapers also reported the largest decline in revenue, though local and network TV and magazines also saw revenue drop. At nearly $24 billion, newspaper advertising revenue fell back to its 1984 level without adjusting for inflation. 5. More and more executives believe that daily newspapers will not offer daily home delivery within five years. Clearly, the magical newspaper algorithm has yet to be revealed. But if I were to guess where to look first, it would be in the very industry that seems to be taking over the news: technology. I read the State of the News Media report as a humble newcomer to the business of journalism in the digital age. Just a year ago, I shifted from being a reporter at The Oregonian to the publisher of the nonprofit student newspaper at the University of Oregon. The job has offered a small but clear window for me to see the daunting challenges of our industry. What I know to be true is that what we have experienced over the last seven years is not a cyclical downturn for our industry. This is a complete disruption of the business model. Need proof that some answers might lie in the tech sector? Consider: Apple’s holiday season revenue in the last three months of 2011 was $46 billion. 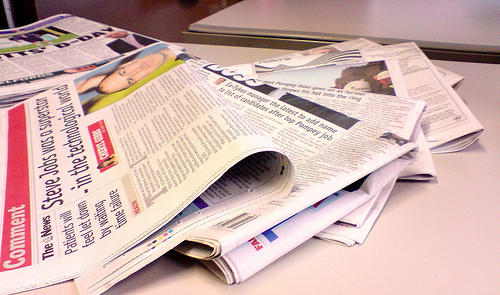 In all of 2011, the entire daily newspaper industry reported advertising and circulation revenue of $34 billion. Now, I’m not saying every newspaper can or should be Apple, Facebook, Google or Amazon. But, it’s time we understood that we’re not wholly different either. One of the few things that seems clear about the future of newspapers is that there is no clear future. There is no model or a single action plan that can be put in place at college, community, metro or regional newspapers to transition them painlessly into the digital age. But there are no shortage of ideas about what could be tried. And that seems like the thread that runs through all of the industry research: Let’s try new ideas and see what sticks. The ideas that make the most editorial and business sense will vary for each newspaper based on the owners, finances, culture, staff and local market. But in short, we need to think more like a tech startup and less like a lumbering legacy company. And as we experiment with new models, we can, and should, use the mantras of the tech industry as a guide: initiative, innovation and investment. We should think bigger and broader about our business. Newspapers have a unique opportunity to redefine themselves as local media companies that create products and services to serve their community of readers and businesses. This concept will make many traditionalists in journalism uneasy. Heck, it would have made me uncomfortable a year ago. I, like many of my former colleagues at The Oregonian, saw the newspaper as a civic institution, not a corporate one. But public interest journalism is expensive. I think often about a haunting line from a 2008 David Carr column. That’s all to say: Newspapers are a civic institution, but we also need to acknowledge that they must be a profitable one if the type of journalism we all care about is to thrive. Just like department stores used to subsidize capitol bureaus, we need to broaden the scope of newspapers to create new ways to subsidize public affairs reporting. Non-profit news startups are doing great work to help boost local public affairs reporting, but the financial model for them remains unproven. This leaves newspapers in the best position to preserve public-interest reporting. So what business are newspapers in? If we consider our customers, we have two types: readers who come for the news and businesses that come to reach an audience. The platform — print, web or mobile — is just a distribution method, just like railroads were a method of transportation. We remain primarily print-focused because that’s where the money is. But we need to continue pushing for new ways to build our readership and revenue in the digital world while still preserving the revenue that the print editions generate. If we take a broader view of the newspaper’s business, here are a few models that might be worth considering. 1. Use technology and data to “organize the community’s information.” Google’s mission is to “organize the world’s information and make it universally accessible and useful.” They do that job well. Newspapers can’t compete on the global scale. But most newspapers still have the brand and infrastructure to do some things better in their local community. For example, online and mobile guides to restaurants, real estate and professional services can be built and cultivated more authentically and credibly than data-bots in Mountain View. 2. Offer digital media services — website construction, SEO, social media marketing, mobile apps — to local businesses. The Houston Chronicle in 2011 reported signing up about 500 businesses for its digital media services worth $2.5 million in contracts, as outlined in a 2011 report “The Story So Far: What We Know About the Business of Digital Journalism” by the Columbia Journalism School. At the college level, The Daily Bruin and its parent organization at UCLA have launched a “web-based portal”:ttp://www.bruinwalk.com/ for its campus and an ambitious effort to build custom mobile apps for businesses and other niche apps for campus groups that provide new advertising channels. 3. Find the right model for print. The print edition will likely exist for years to come in some form. The strength of the print edition varies by market and management group. But more and more daily newspapers will look seriously at Sunday only or two or three times per week. That will allow newspapers to build more robust digital operations to serve the growing demand for news and information on the web and mobile devices. How urgent is the need for innovation? Eight years ago urgent. Let’s hope that line doesn’t get repeated again in 2013. There is no sugarcoating this fact: We cannot continue cutting and expect to be around for the next generation of readers. Newspapers have sliced payroll and pages to maintain short-term profitability. Profit is good. We all like to get paid. But the decision not to invest in the ideas that show initiative and innovation will leave us to only manage a long, slow descent. A major metro can cut down to a staff of 50 and stay profitable, but it will lose its most valuable asset: credibility. Apple announced this week that it would buy back stock and offer a dividend to unload part of its ever-growing stockpile of cash. Yet, CEO Tim Cook was careful to declare that Apple’s top priority was to retain cash to pay for research and development. Google invests in a secret lab that’s developing crazy ideas for the future: refrigerators that order groceries and elevators that whisk you to space. Here in Oregon, our most iconic company was cooked up on a waffle iron that created an innovative sole for running shoes. R&D is at the heart of all growing companies, especially in a digital age. Budget cuts allow companies to survive a downturn. But cutting doesn’t leave much room for a company to reinvent its business model. This will require difficult choices about what jobs newspapers should stop doing so they can afford to build laboratories for new media. The early returns on newspapers’ digital media innovations are inconclusive. But companies that have shown the most initiative, created innovative products, and invested in sales and marketing muscle have had the best chance at success, even if that success is modest at first. That’s a trend that is likely to continue. Granted, these are new and uncertain business models — models that may or may not even boost newspapers. Some may find them too risky. And, it’s true, they may fail. But in 2012, the riskiest decision is to do the same thing we did in 2004. Ryan Frank is the publisher of the Oregon Daily Emerald, the non-profit student news organization at the University of Oregon. He previously worked for 11 years as a reporter at The Oregonian.